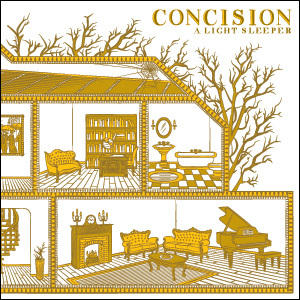 Click here to stream Concision. These are keys unpressed, strings unstruck, air undone; the before and after of something else all at once. Following fast on the heels of Brevity, Another New Calligraphy presents the latest artifact in the always intensifying world that is A Light Sleeper: Concision. It was four years ago that we stumbled across two gentleman gently blowing minds in a woefully gone church-space. Debuting as a quintet with this release, the group’s reach has grown to relatively immense proportions yet still retains its graceful clockwork core. Sounds pummel one second and tiptoe the next, lacing through each other in a systematic confusion. This is a beautiful noise, and if the past is any indication, only the current chapter in A Light Sleeper’s onward march. Concision additionally features the conclusion of Robyn Detterline and Bill Ripley’s storyline from the preceding release. Drawing upon phrases from the lyrics as inspiration, this supplementary tale weaves a narrative based upon the quiet damage of the everyday and features two families separated by time sharing a single home. Read on as the characters pass each other unknowingly, lost in their private melancholia, shattered dreams, and wrinkling bathtub toes. ANC015 is out of print.